11 Best Beach Resorts in Turkey to amaze you! Home Interests Beaches Resorts 11 Best Beach Resorts in Turkey to amaze you! Travelers who are looking for the best beach vacation destination may want to consider the Turkish Riviera. Here the guests are all drenched in luxury along with wide variety of water activities from waterslides to windsurfing to just lounging on the beach. Either you can relax having a spa treatment or can have a traditional Turkish bath. In addition, these resorts are beautified with many international cuisines along with fitness centers to work off those calories. You will find most of the best beach resorts in Turkey between Antalya and Alanya, with a few near Bodrum and Oludeniz. 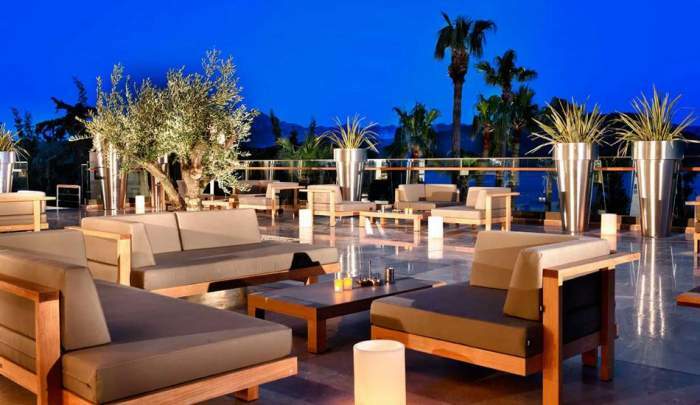 The Kempinski Hotel Barbaros Bay near Bodrum is a luxurious relaxing resort having a private beach on the Aegean Sea. It is renowned for offering activities that are not found at any other Turkish Riviera resorts, including sailing school and diving classes. Guests can also enjoy a catamaran ride, go windsurfing, or hike or bike in the surrounding hills. The Kempinski offers a kids club for when kids and parents want a separate time for enjoyment. The hotel also pampers pets with their individual beds and special treats. 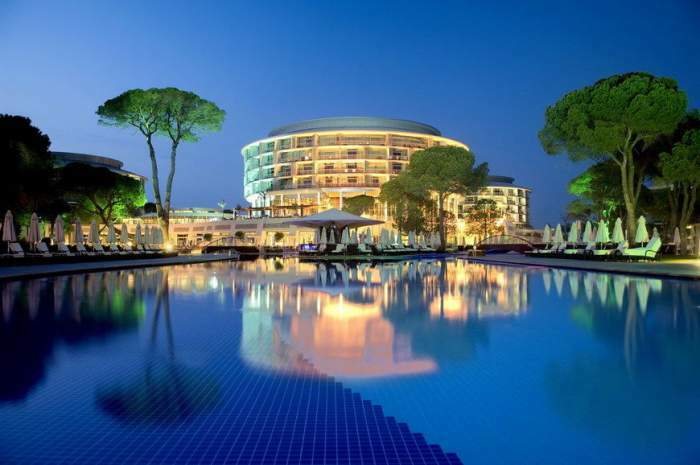 It’s acknowledged as one of the best hotels in Turkey. Nearby Attractions: Zeki Muren Arts Museum, Castle of St. Peter, Bodrum Museum of Underwater Archaeology, Bardakci Cove. Gypsophila Holiday Village is sandwiched between Alanya and Side. It’s an older property that contains 404 rooms. The exquisite holiday village offers limited activities but does have a swimming pool, fitness center, and internet access. It has only one restaurant, but it has one of the most comprehensive foot buffets on the Turkish Riviera. Rooms have balconies close to the pools or gardens. Nearby Attractions: Alara Kalesi, Water Planet Aqua Park, Alara Grand Bazaar, Yoruk Muzesi. Hilton Dalaman Resort And Spa credits to be an award-winning resort which is just a 10-minute walk from downtown Sarigerme. The resort has its own private beach with a cottage for guests’ use a well as 10 indoor and outdoor swimming pools. A number of water activities are offered in addition to a spa and business center. You will be in dilemma of reaching one of the top food places as the Hilton Dalaman Resort And Spa is loaded with 23 restaurants and bars. 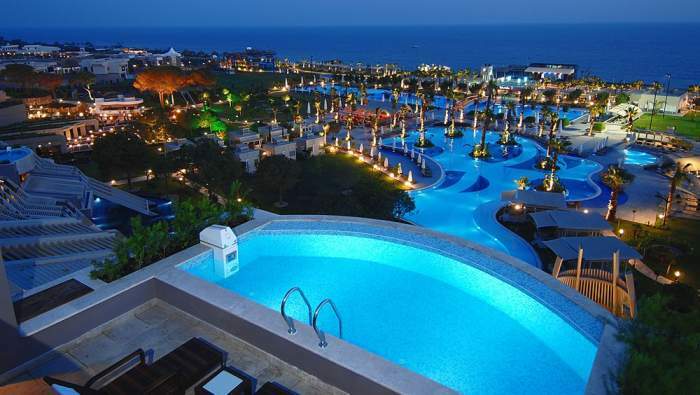 It’s acclaimed as one of the best resorts in Turkey. Nearby Attractions: Sarigerme Public Beach, Asi Koyu. The Royal Wings Hotel rests at a distance of 18 km (11 miles) from downtown Antalya. It keeps the guests so busy that they won’t have time to go to town. You can visit this hotel with your family as it has nine waterslides. Situated just a few minutes’ walks from the beach, the Royal Wings Hotel offers you one of the best-organized activities in the daytime while shows at night. It is rooted with 18 acres of carefully look after grounds. Nearby Attractions: Perge Ancient City, Duden Waterfalls, Lara Beach, Sandland. 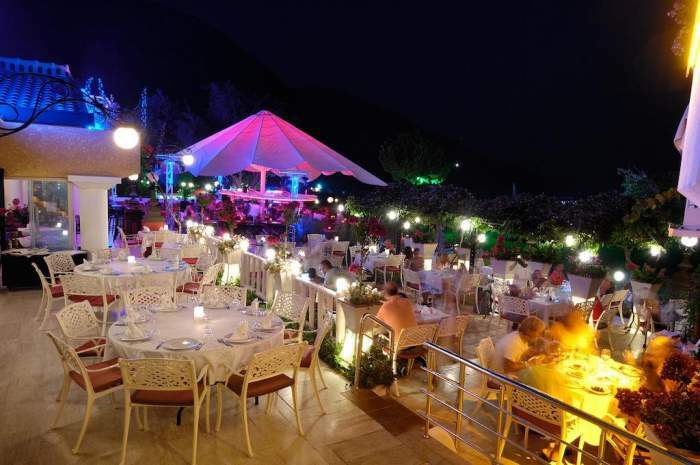 The Club Belcekiz Beach Hotel, Oludeniz, is like a rainbow at night, with colored lights being lit up in every corner from the dance floor to poolside throughout the resort. The resort has a serene ambiance of the garden setting, with guests rooms that have a pool, mountain or garden views. The Club Belcekiz Beach Hotel occupies four restaurants, including one that serves buffet-style, along with five bars and a nightclub with DJ nights. Free parking is available on-site. It’s one of the best Turkish hotels. Nearby Attractions: Savana Spa Wellness, Skystar Paragliding, Sky Sports Paragliding, Re Action Paragliding, Sanctuary Day Spa & Turkish Bath, Buzz Beach Bar, Gravity Tandem Paragliding, Oludeniz PlajI. D-Hotel Maris is one of the best places to go scuba diving and snorkeling. It is something that offers you more besides offering pools overlooking the waterfront. People who are unfamiliar with the sea will enjoy being close to hiking and biking trails or they may go for horseback riding in the hills neighboring the D-Hotel. A little adjacent to the hotel is the Marmaris Dolphinarium-Aquapark and Aqua Dream Water Park. Also, known to be one of the best resorts in Turkey. AC guest rooms are simple yet beautifully decorated, offering safes large enough to hold laptops. The resort is completed with four restaurants and a full-service spa. Free WiFi access is located all across the resort. Nearby Attractions: Piano Bar Selimiye, Marmaris Museum, Semi Submarine Marmaris, Hydas Bar, Anfield Bar, Turgut Selalesi, Eren-1, Marmaris Balevi, Sogut AgacI Cafe & Atolye, Deniz Bey-1. 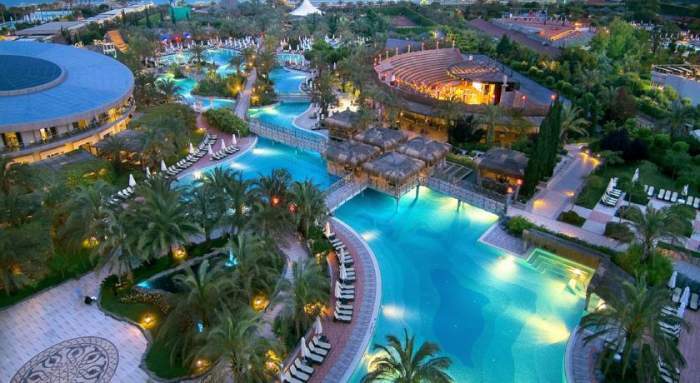 The Calista Luxury Resort is located half-an-hour away from the Antalya airport. It’s an all-inclusive beach resort packed with five tennis courts that are lit for night-playing, soccer fields and a huge spa that serves you with a variety of relaxing treatments. The golfers here will appreciate the 10 courses located within a four-mile radius. Dining in Calista could be a challenge, however, as the resort jam-packed with 10 restaurants serving a variety of international cuisines. Nearby Attractions: Sueno Golf Club, The Montgomerie Maxx Royal Golf Club, Belek Town Mosque, The Land of Legends Theme Park, Aspendos Ruins and Theater, Sirene Belek Hotel Golf Course, Kaya Palazzo Golf Club, The Brezza Bar. Royal Dragon Hotel is a Chinese-theme based resort. 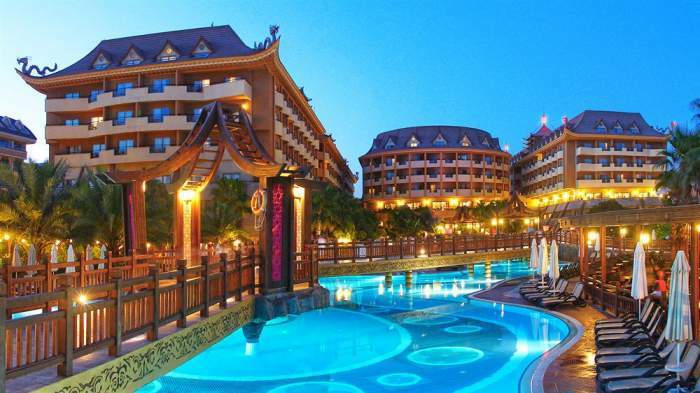 The hotel is all embellished right from dragon entrance floor, luxury resort equally goes hand-in-hand with traditional Chinese architecture with modern amenities such as water slides, a bowling alley, and decorated fitness room. All rooms have private balconies for guests who wish to do their lounging inside rather than poolside. Nearby Attractions: Side Antik Kenti, Vespasianus Aniti, Temple of Apollo, Monumental Fountain (Nymphaeum), Side Museum, Side Azura Dive Center, Tyche Tapinagi. The Barut Lara Resort Spa & Suites is personified in a magnificent location: ocean views and carefully tended green gardens. 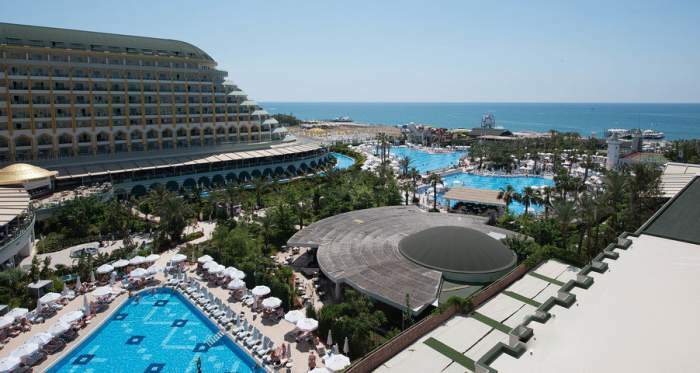 But this beachfront property is located 10 km (6 miles) from Antalya airport. Guests can lounge by the beach, swim in indoor and outdoor pools, go for the spa or have a Turkish bath. 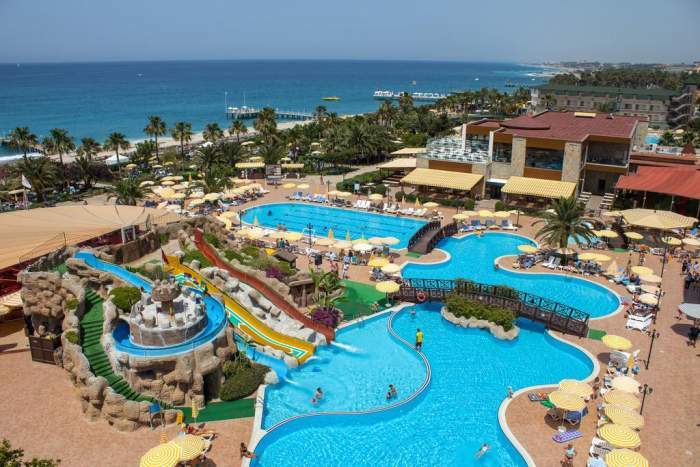 With a well-maintained and equipped fitness room for more interested guests as well as a playroom for children this is one of the best beach resorts in Turkey. Nearby Attractions: Aksu Dolphinarium, Hana Transfer, Fortune Rafting, Duden Waterfalls, Perge Ancient City, Greek Amphitheater, Kaleici, Lara Beach, Carya Golf Club. 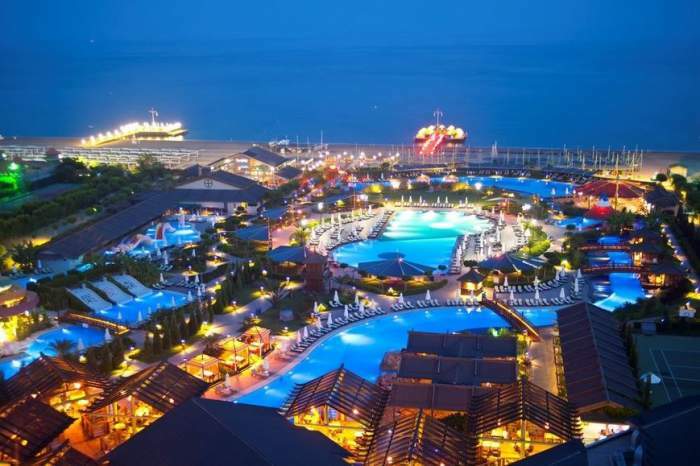 Delphin Diva Premiere is settled nine miles from downtown Antalya, offering plenty of activities to seal the interest of people at this luxury beachfront resort. Guests can have amusement on the private beach or swim in a pool with its own water slide. More than that there are a tennis court and bowling alley for more active guests, who can dine in one of several international cuisine restaurants in between. All rooms are having private balconies. For guests, free parking is available who arrive in their own cars. Nearby Attractions: Fortune Rafting, Novaraft, Antalium Premium Mall, Perge Ancient City, Greek Amphitheater, Kundu bazaar, Carya Golf Club. Bodrum is an enthralling blend of ancient and modern where both combine to form a chic resort town and a place where you’ll witness traditional whitewashed houses, blue-spired minarets and wooden gulet (sailing ship) yachts tied-up in the harbor. Its Greco-Roman remnants are unusually well preserved, including an amphitheater now used for live music and the ruins of the Mausoleum – one of the wonders of the ancient world. The 15th-century castle is home to the Museum of Underwater Archaeology, with treasures from Aegean shipwrecks. From its own airport, Bodrum is just half an hour by road. 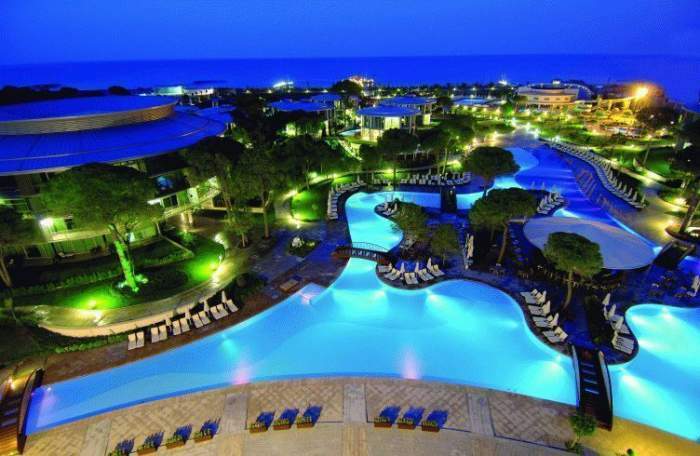 It’s one of the best luxury beach resorts in Turkey. It’s one of the best beach resorts in Turkey. Nearby Attractions: Castle of St. Peter, Museum of Underwater Archaeology, Sunbathe on the Bodrum Peninsula Beaches, Mausoleum, Myndos Gate (Myndos Kapisi), Bodrum Theater, Marina and Shipyard. Previous article13 Best Mexican Restaurants will make you licking fingers! 6 Luxurious Villas In Andaman That Guarantee A Lavish Stay And Sunset! India’s First Women-Only Hotel, Run By Women-Staff Is Opening Soon!